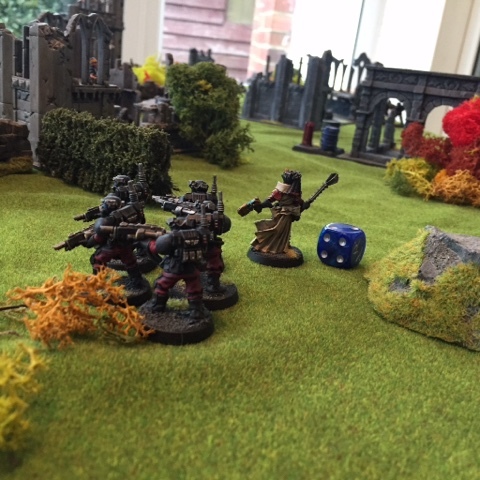 Following on from Inquisitor Athena receiving her mission brief the other day (see here for the prelude and playsheet: Battle Report Part One ) the time rapidly arrived where it was time for us to do battle. 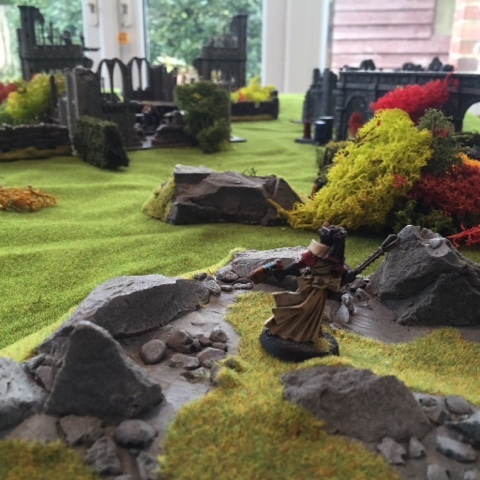 For the game itself the noble Inquisitor commanded the forces I have listed in the previous post whilst I represented the emerging cult. 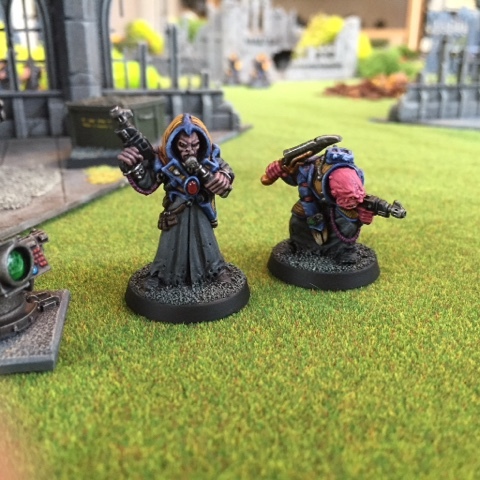 At the start of the game the nature of the cult was finally revealed as the many squads of cultists were invariably led by third generation Genestealer hybrids....whilst the overall force was commanded by a charismatic Genestealer Magus. 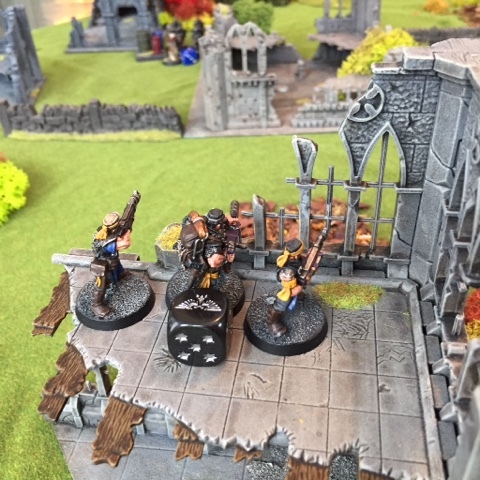 It appears that the world of Logan's Bluff has been infested by a cabal of Xenos filth.....It's time for the Emperor's Inquisition to deal out appropriate retribution for the sin committed by these heretics. 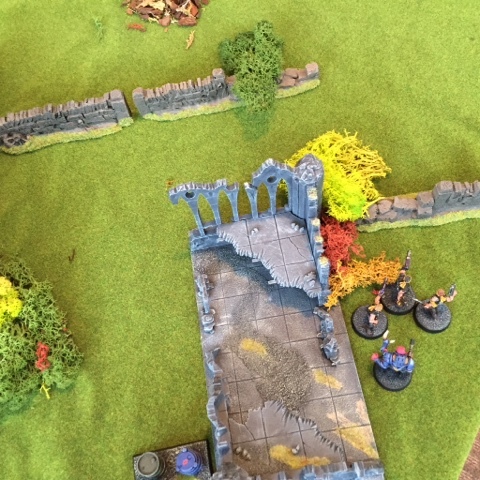 Set up was dictated by me in my role as GM and consisted of the cultists and their xenos masters concealed in the ruins of the dilapidated monastery whilst the Inquisitional forces approached from a nearby rocky outcrop. 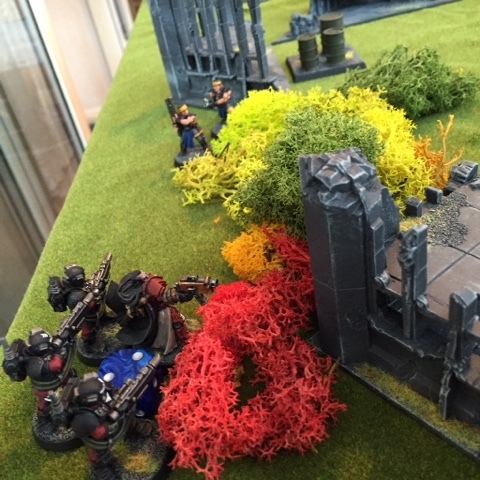 In the photo above you can see that Inquisitorial Operative XV-98 is pinned in some bushes to the left of the ruins. 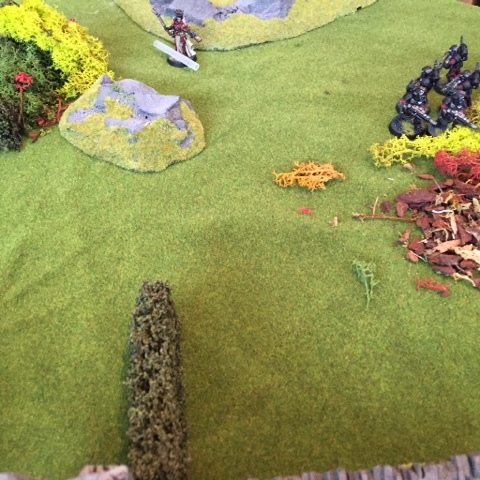 In order to save (and use) this extra character Inquisitor Athena had to get a unit of troops to his location, after that he would be controllable by my girlfriend. 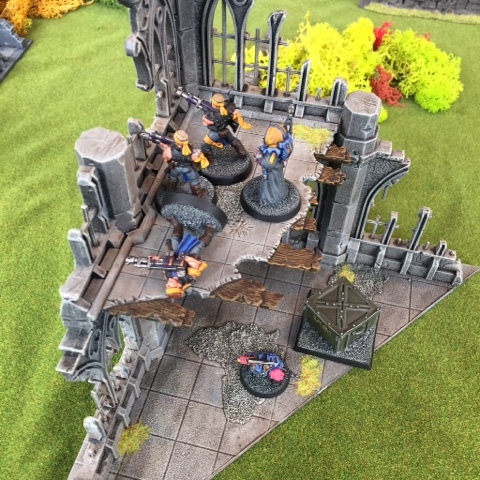 The cult forces were led by a Genestealer Magus assisted by a number of later generation hybrids who used their formidable skills to augment the ordinary human brood brothers that constituted the bulk of the force. These brood brothers were equipped with an eclectic assortment of small arms and melee weapons, though they possessed no armour. They were split into three man groups that were randomly deployed around the ruined buildings. Athena and her Inquisitorial Storm Troopers approached under the cover of a nearby natural outcrop of granite which allowed them a protected route of egress. Athena quickly casts an aura of protection using her psionic powers, and this allows her to augment her already impressive armour save by one point until she takes a wound. This is represented above by the force field (paintbrush bristle protector) laying across her base. ...However their lack of body armour proves a key weakness and soon the casualties amongst the brood brothers start to rapidly mount up. 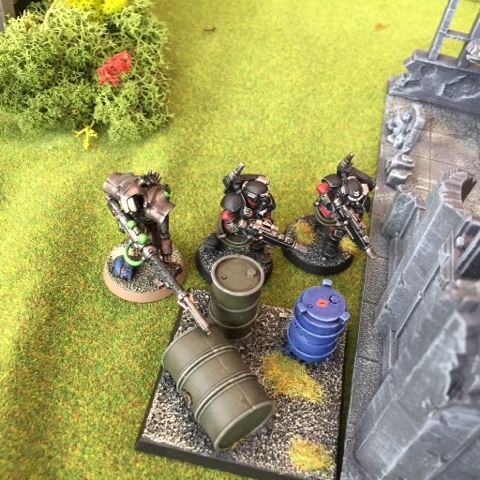 The disciplined fire of the highly trained Inquisition troops allows them to act as a real force multiplier and exponentially increase their combat efficacy compared to the poorly trained bulk of the cultists. 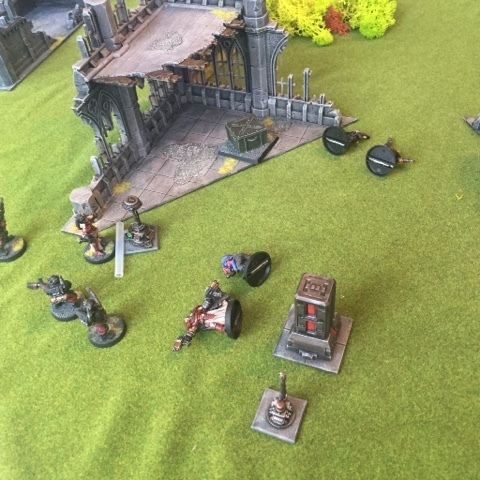 However as with all conflicts sometimes luck can throw a spanner in the works and a particularly potent volley of focused autogun fire slays three Storm Troopers as if their armour was naught but mere paper. 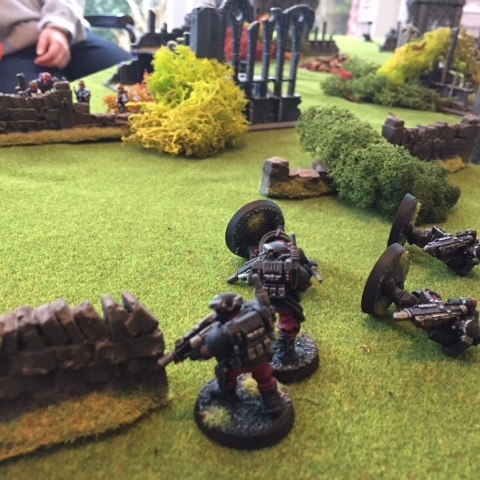 Their sacrifice isn't in vain and it buys time for a second squad to slip around the other side of the table and creep forward in relative safety. 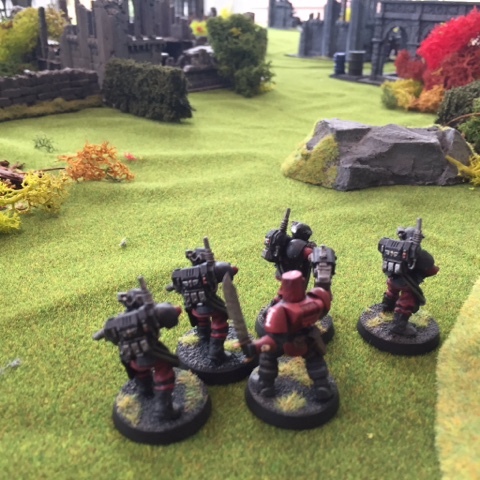 Meanwhile a third squad of Storm Troopers manages to slip into the Inquisitorial Operative's location and free him from being pinned; they then get caught in a brutal short range firefight with some nearby fanatics carrying shotguns. With her forces consolidated and her agent rescued the Inquisitor charges forward in an all-out assault, bullets from the storm troopers and mental bolts from her mind quickly reduce the nearby foe to steaming piles of flesh. 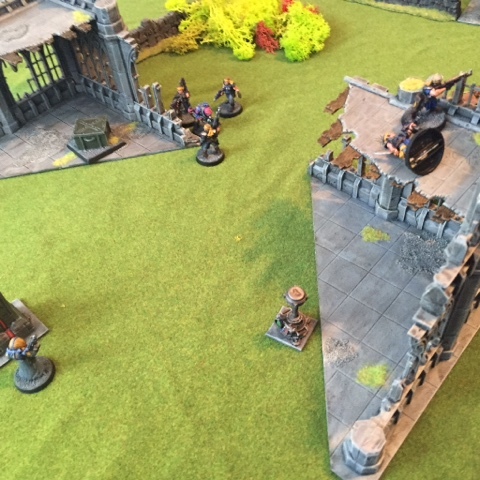 Meanwhile the Agent and the cultists remain locked in an unceasing exchange of solid shot and laser beams on the far flank, this slowly descends into a war of attrition. 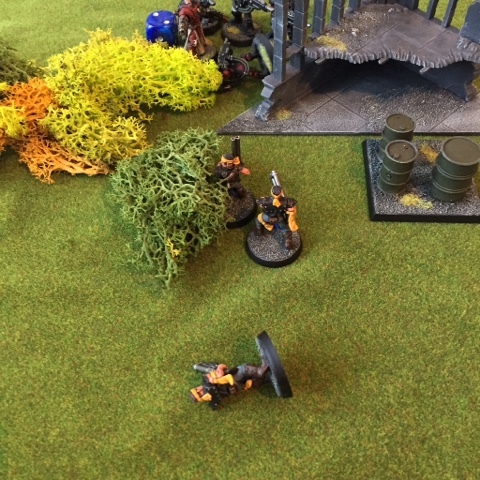 Athena moves to secure one of the supply dumps littered around the battlefield and a member of her retinue smiles with maniacal glee as he is able to swap his lasgun for a far more potent flamer. ...however his erstwhile comrades are quick to counter this threat and don't think twice about pumping shell after shell into his convulsing body causing him to collapse to the floor dead. 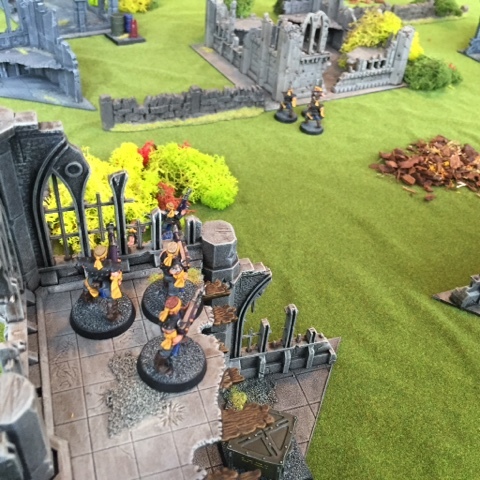 With their numbers dwindling the genestealer forces fall back to the centre of the monastery in order to try and reinforce their position. Luckily all brood brothers and hybrids are immune to psychology so the gravity of the situation does little to reduce their fighting ability. 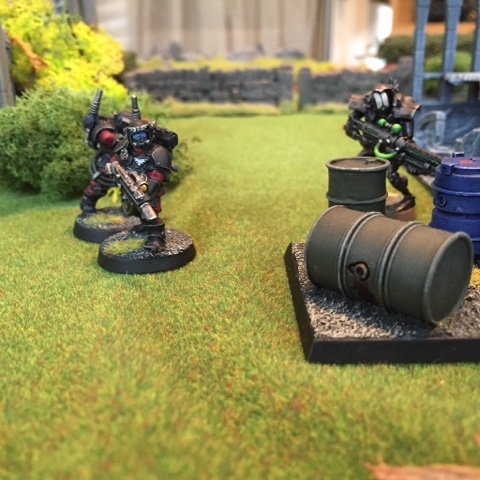 A second supply dump is raided by the Imperial Forces and this time a defunct combat robot is found inside. After a bit of ad hoc repairing (Intelligence Test) the Storm Troopers are able to activate it and the construct joins their unit. 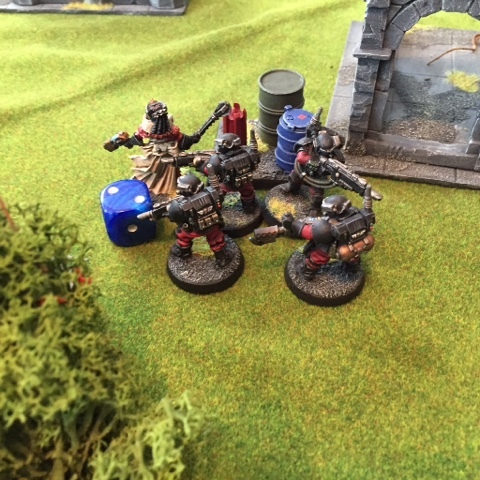 When the third supply cache is accessed Inquisitor Athena finds a teleport beacon concealed within which allows her to requisition a further squad of Storm Troopers from her ship. These additional resources quickly link up and move forward to support Athena's assault. The newly activated combat robot's weapons are substantially more powerful than its human allies and so it is moved into a position where it can bring this increased firepower to bear. 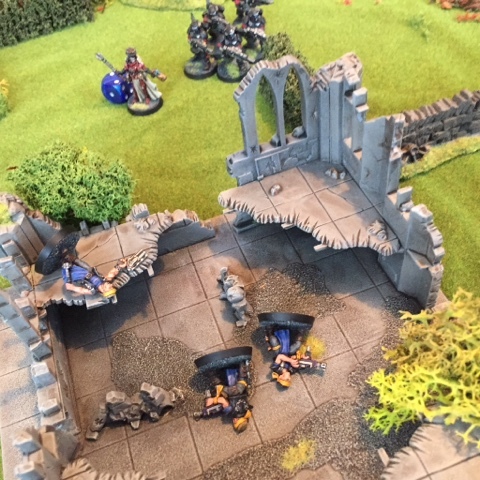 Pretty soon the genestealer force has been reduced to a small pocket of dwindling resistance in one corner of the battlefield. 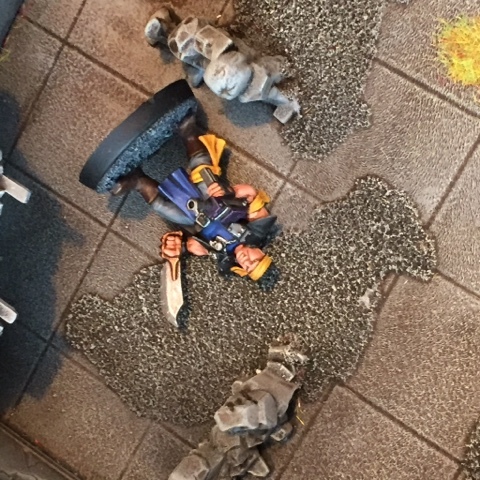 With the writing on the wall the Magus is quick to realise he is far too precious to the cult to expend his life in a lost cause and so quickly dashes of the table edge....leaving his expendable troops to their inevitable demise. 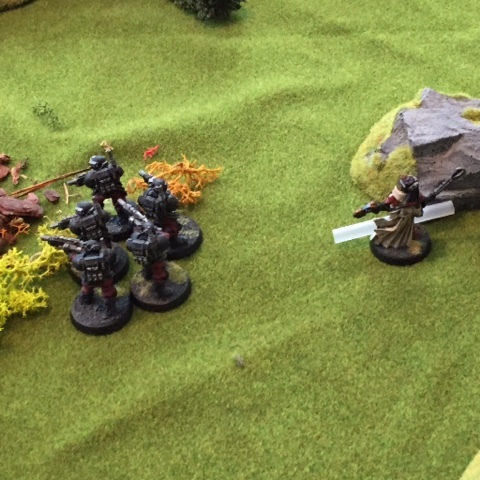 And so the Inquisitor's staff slaughter the remaining xenos filth in short order. With the aliens dead their computer mainframe is accessed and Athena is able to download a substantial amount of raw data for subsequent analysis by her thrall tech priests...hopefully this will provide some more information on the cult and more importantly the locations of any headquarters that they may be utilising. This was a really great game for both of us and was full of the twists and turns that are a trademark of Rogue Trader battles. The addition of certain features such as the random loot/supply caches makes the game a lot more interesting and really rewards a player who engages in the narrative as opposed to just trying to achieve specific missions. We hadn't really used the psychic powers from RT before and I am glad we did, they were great fun and more importantly they were really balanced. 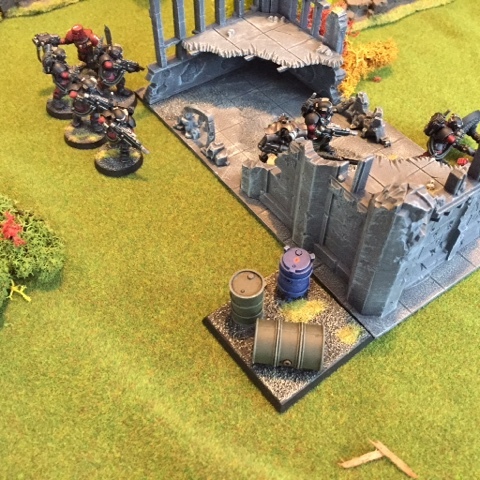 This is probably the only set of psychic rules throughout 29 years of 40k that are actually quite intuitive to use and provide a sound tactical option as opposed to a game-changing whirlwind of death. We will definitely be using these again. As you have probably guessed this was not a one-off battle, instead it will form the first installment in a new campaign/story-arc for Athena! The planning for the next phase in this epic saga is already in the initial stages and I will of course up date you as it progresses! 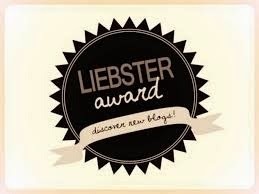 I hope you have enjoyed part one! Great AAR as always! Pics are truly inspirational! Cheers Suber!! I'm glad you enjoyed it mate; hopefully this will be the first of many in Inquisitor Athena's new campaign!! Lots to like here: great narrative and some superb painting. The old plastic Orlocks look very crisp,and I love the colours on your stormtroopers. Cheers Preacher! I'm glad you enjoyed it! 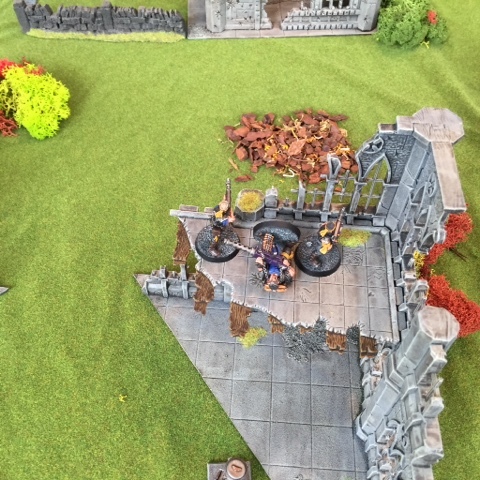 I do love those old Orlocks...so many uses outside of Necromunda! I think I based the Storm Trooper colours on the old codex Daemonhunters from about 2002! 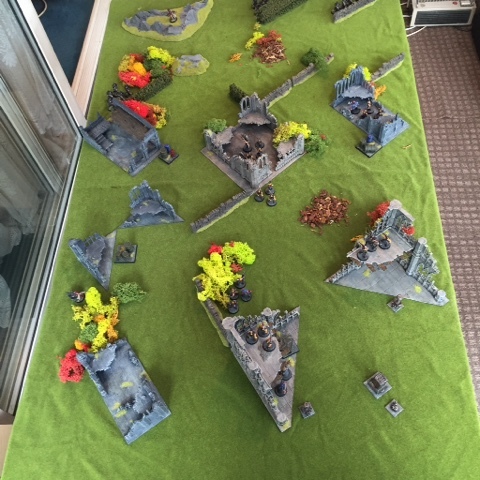 Cool report, its neat to see some classic, and neglected now, armies in action.